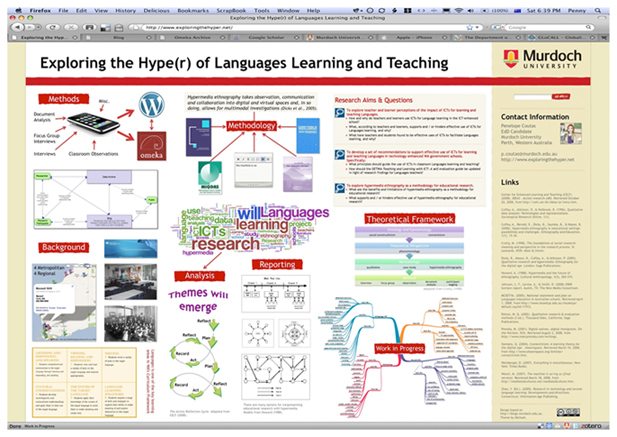 This is the poster I've made for the GloCALL conference in Indonesia 08-13 November. It reports on my work in progress and is essentially a graphical representation of my research proposal. I designed it to look like a website because my work is not meant to be "viewed" in a linear fashion: I am exploring hypermedia, hypertext and the links between phenomena, viewpoints, artifacts and concepts after all! I find it interesting that people immediately ignore the task bar above and below. Are we becoming so used to working within a browser interface that we don't even see it anymore? The poster below links to a low-quality jpeg (900Kb). Click here for a better quality A4 pdf (7mb), or email me for the original A1 size.